The text below was nicked from Michael’s website. Be sure to check out not only this project, but his other one’s as well. 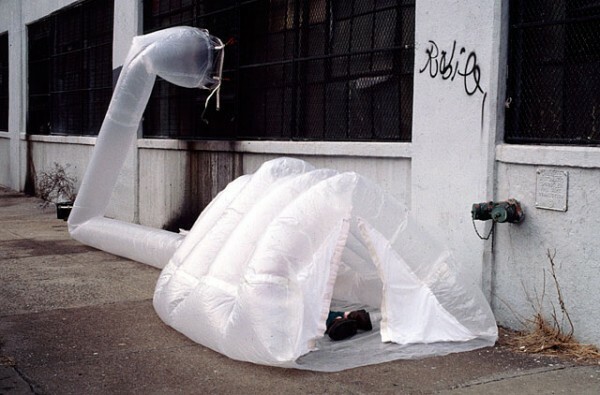 “ParaSITE: Custom built inflatable shelters designed for homeless people that attach to the exterior outtake vents of a building’s Heating, Ventilation, and Air Conditioning (HVAC) system. The warm air leaving the building simultaneously inflates and heats the double membrane structure. Built and distributed to over 30 homeless people in Boston and Cambridge, MA and New York City. The paraSITE units in their idle state exist as small, collapsible packages with handles for transport by hand or on one’s back. In employing this device, the user must locate the outtake ducts of a building’s HVAC (Heating, Ventilation, Air Conditioning) system. In April of 1997, I proposed my concept and first prototype to a homeless man named Bill Stone, who regarded the project as a tactical response. At the time, the city of Cambridge had made a series of vents in Harvard Square “homeless-proof” by tilting the metal grates, making them virtually impossible to sleep on.